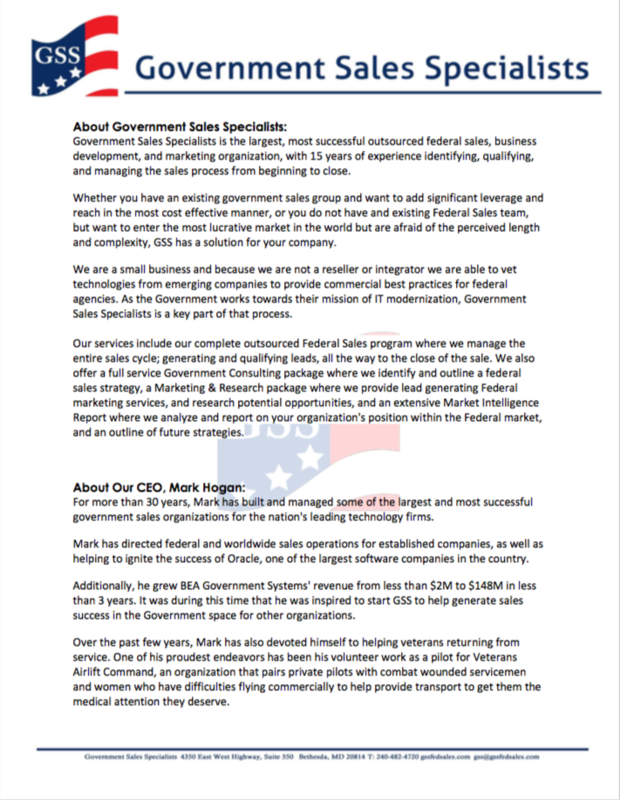 Our whitepaper features fascinating insights on overcoming B2G's biggest challenges, how to effectively market your product, and the elements of a winning federal sales program. 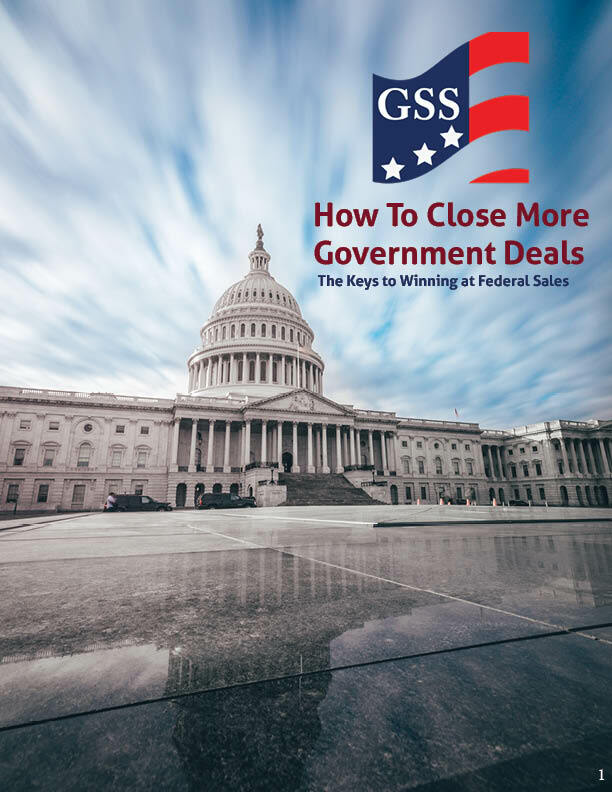 See how gaining an in-depth understanding of access, knowledge, and management of the inner circle can provide applicable tools and commercial practices to best launch your business into the federal realm. An outline of our service offerings, including a basic pricing model. 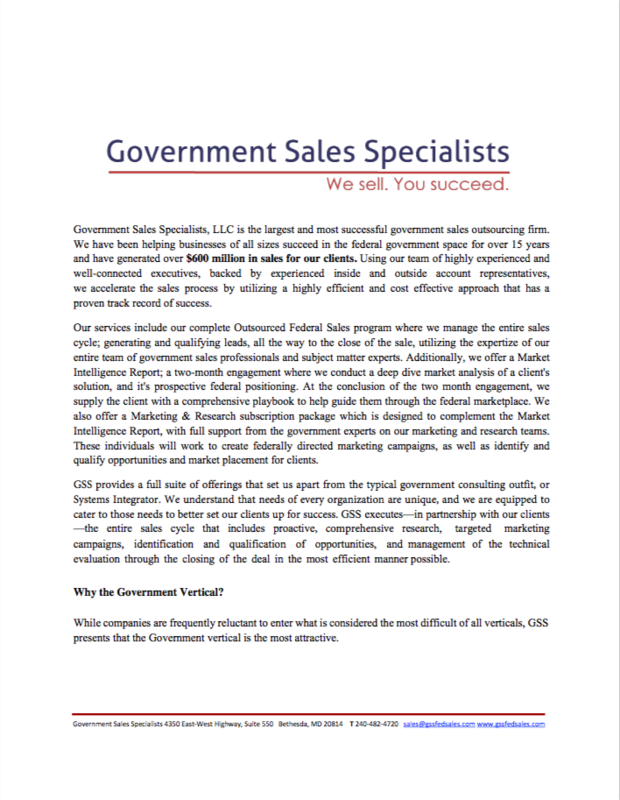 This includes out complete Outsourced Federal Sales solution, our comprehensive Market Intelligence Report, and our Marketing & Research subscription package. Each service is described in depth, complete with deliverables, and the basic set of tasks that we accomplish for all our clients. All of these services can be tailored to suit the individual needs of each client. 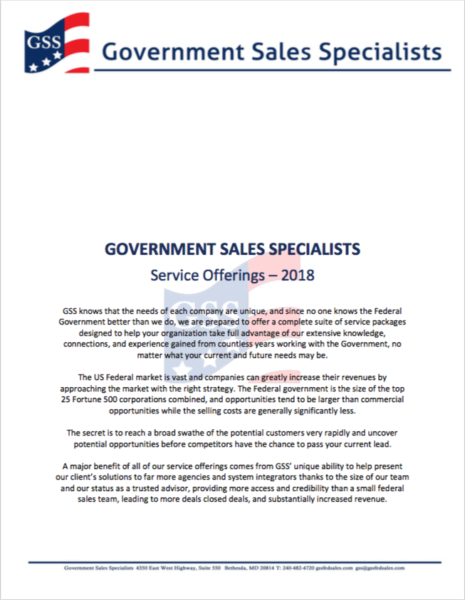 A PDF slideshow that explains a general overview of GSS including a bit of our history, past accomplishments, as well as more current information like service offerings, and key differentiators that set us apart from other organizations that work in government sales in some capacity. In this document, we explain our company and our services in a client facing capacity; directed at tech professionals, and IT organizations. This explains what GSS can do for you, and how our different service offerings can be tailored to meet your individual needs as a company. 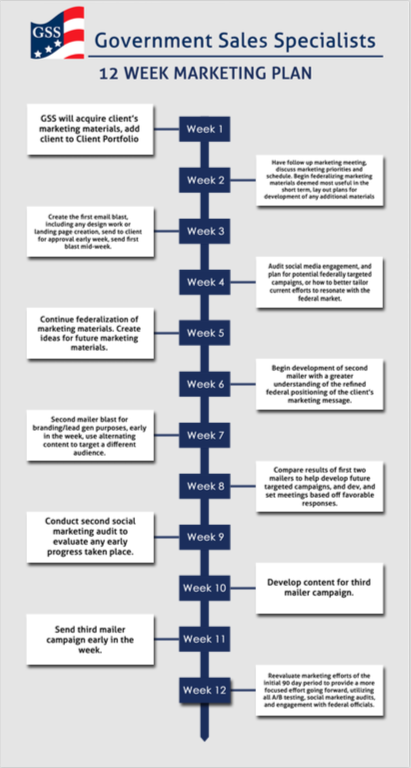 Here, we provide a sample for what a typical first 12 weeks will look like for clients of either out complete Outsourced Sales program, or our Marketing & Research subscription package. 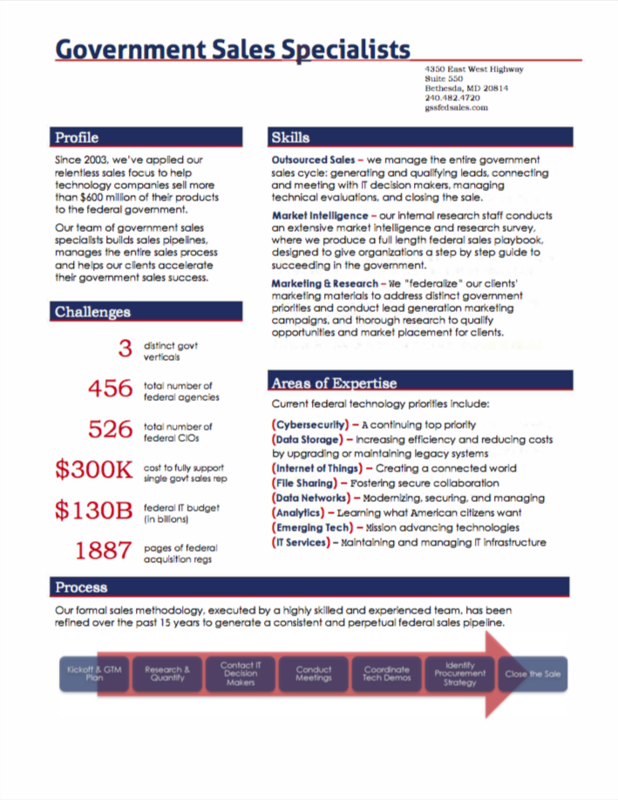 This involves everything from introductions and kick off meetings, to familiarization with our client's content, to the composition and execution of email marketing, social media campaigns, and consultation and evaluation of current marketing offerings, and their relevance to the federal marketplace. Our sample Activity Forecast Document, or AFD, is an actual AFD for a former client. However, this is still only a sample, and the amount, value, and types of deals will vary from client to client. This was designed to be a glimpse at the sort of deals that we work with on a regular basis. All identifying or sensitive information has been redacted to protect the privacy of our client, and their forecasted deals. 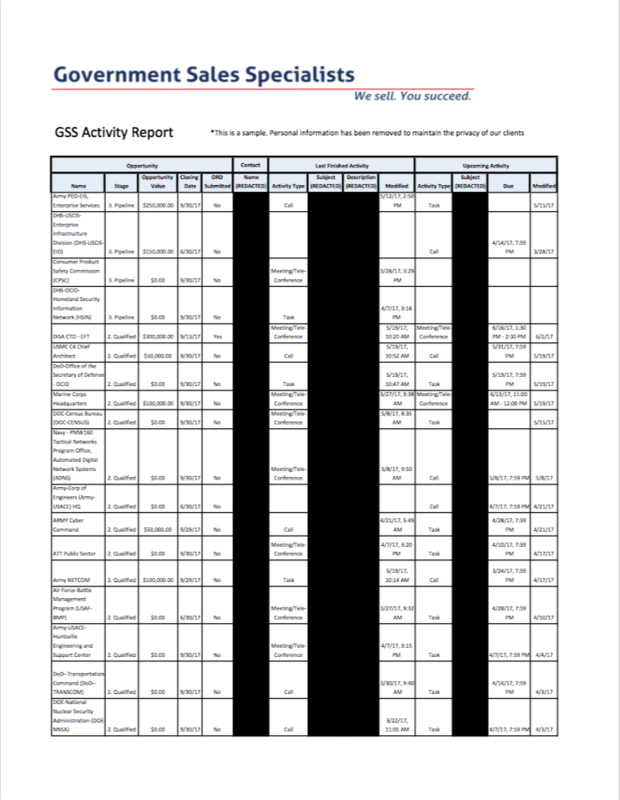 This document is similar to the "About GSS" document above, directed towards our IT industry clients. However, this document is written for Government officials. 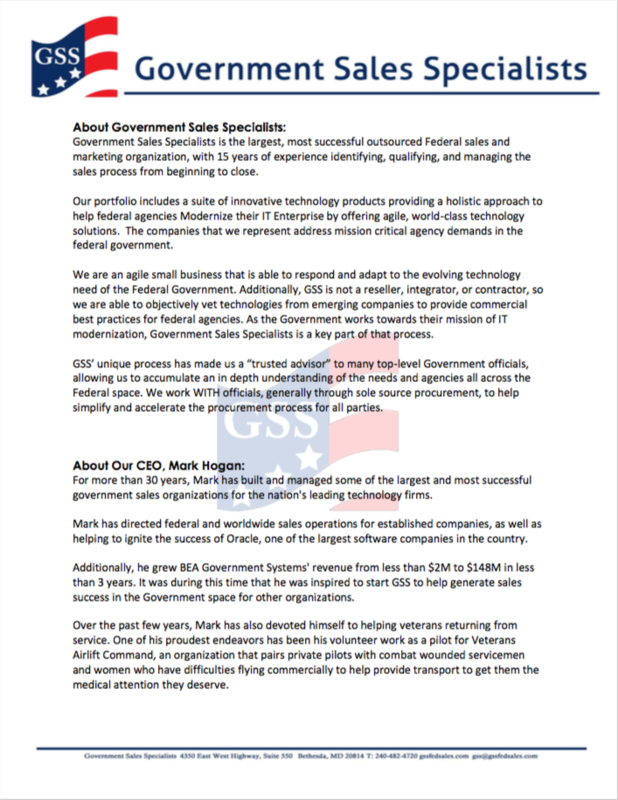 It is designed to explain what it is we do for those in the federal marketplace that are unaware of our services, and why we are different than your average government consulting firm, or systems integrator. Our corporate resume showcases a number of our core competencies, accomplishments, deals closed, and a list of industries that we keep an especially close eye on. This is not a comprehensive list, but it meant to act as a one-sheet rundown of some of our proven successes, and what we're looking towards in the future. Getting involved in the federal space is not an easy nor cheap endeavor. To do it right, the average organization can expect to spend upwards of half a million dollars annually. Additionally, even with the appropriate level of investment, without the right connections and experience, success is not guaranteed. This document shows a comparison between the average company's appropriate investment in the federal space, and the cost of our services. 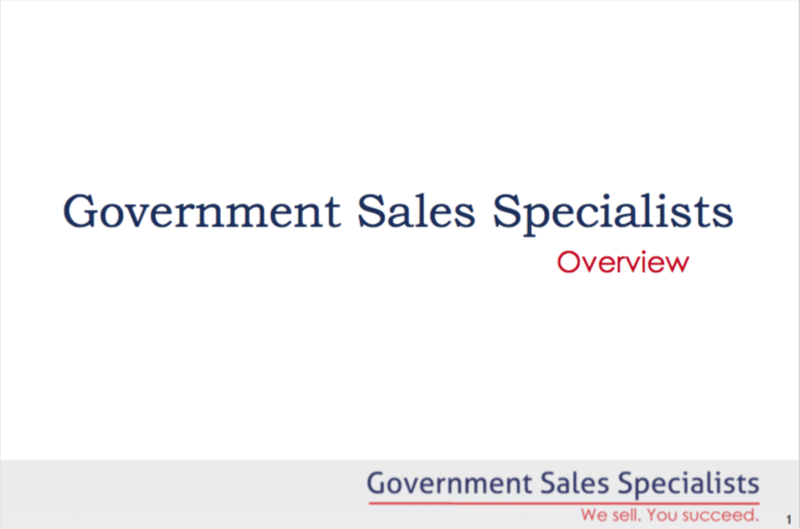 We hear from companies all the time that have attempted to set up their own federal sales division and have been met with some difficulty. 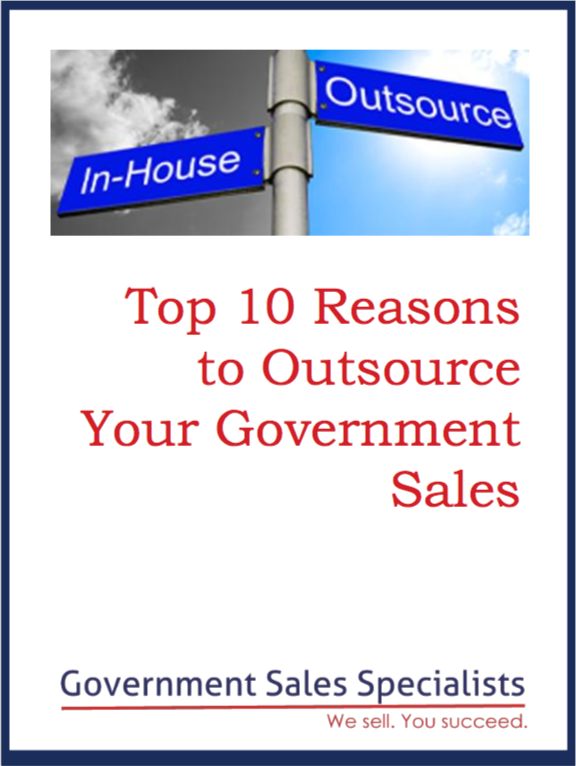 This document shows you why outsourcing is not only a good idea, but a cost-effective solution that will take a great deal of stress off of your own operations at the same time.